Over two thousand march through the centre of London for animals in labs. 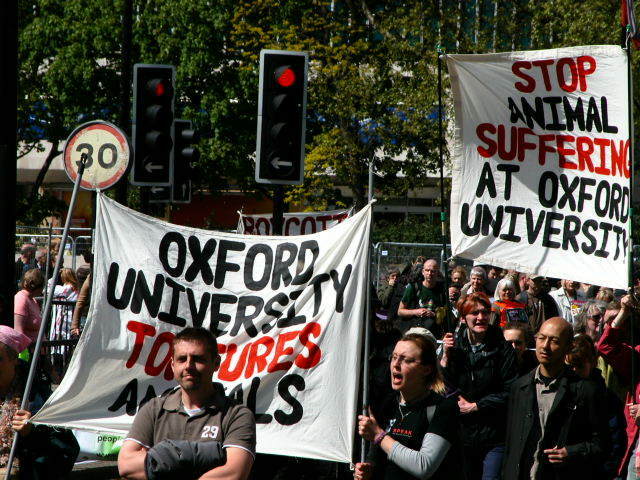 The march was organised to call for an end to vivisection both in the UK and elsewhere, in response to Labour’s abandoned pre-election promise for an official inquiry into animal experimentation. 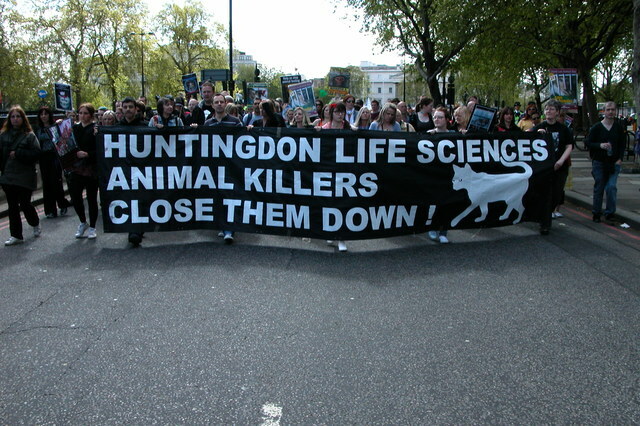 It has been over 15 years since the anti-vivisection movement marched in London to mark World Day, successfully uniting, mobilising and attracting new activists to the movement. Campaigners in attendance included Stop Huntingdon Animal Cruelty (SHAC), SPEAK Campaigns, Stop Wickham Animal Testing (SWAT), vpsg.org">prisoner support groups, as well as Animal Liberation Front (ALF) supporters and green anarchists. 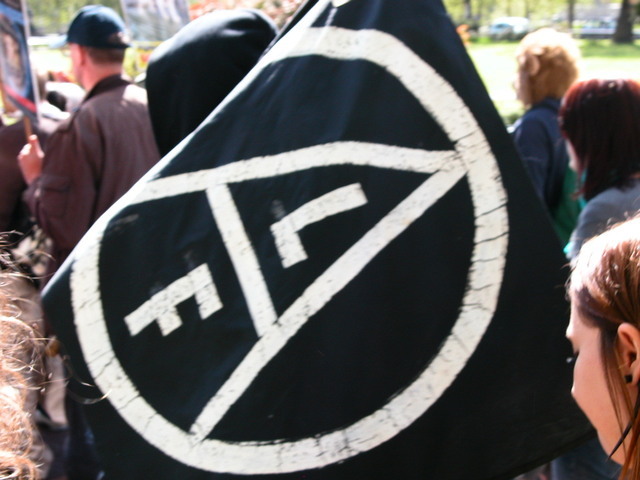 Months of planning and discussion had gone into staging the event, both at grassroots level and discussion at the ARC meetings, a forum set up to allow better dialogue between the various groups which have dedicated themselves to Animal Liberation. 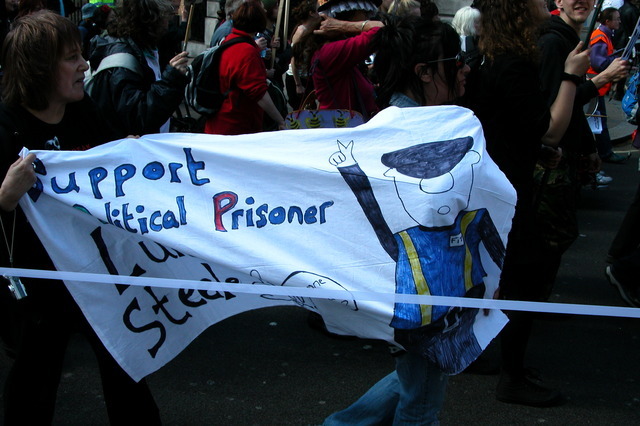 The overall attendance reflected this hard work, showing a movement that many had thought to be in decline following recent high profile arrests and imprisonments to be as strong and united as ever, both in numbers and resolve. 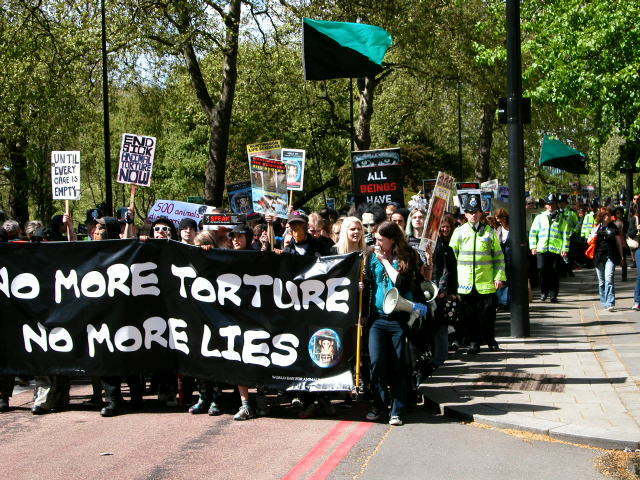 At approximately 2pm the demonstrators began to line up near to the memorial in Hyde Park for animals killed by war and set off behind a banner proclaiming “No more torture, no more lies!”. The flow of people filing around the corner stretched as far as the eye could see and drums, whistles and megaphones kept a steadily chanting crowd moving along as one. The police, clearly nervous at first were later seen reading campaign leaflets given to them by protestors and discussing animal rights issues amongst themselves. As the protest filtered through towards the city centre, the numbers were swelled by unconnected passers by who spontaneously joined the march in a show of disgust with the practice of vivisection. Rounding the corner into Trafalgar Square, a call went out from the front of the demonstration for silence which, owing to the length of the procession, took several minutes to filter through to the back. There was then a moment of quiet refelection and a slow, sombre march which emphasised the serious nature of the event and horrific atrocities commited in the name of science. This presented an eerie sight to the tourists and residents of this part of London, no doubt used to reading in the mainstream press stories of undisciplined, foaming at the mouth anarchists who only ever campaign using violence and threats. 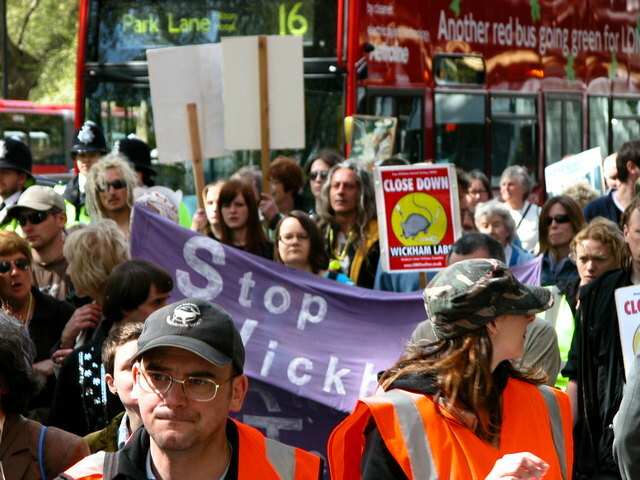 The positive, focused attitude and approachability of everyone involved in the march was fundamentally important in showing the true face of animal activism, and thousands of unconnected people will have left the city with an enlightened understanding of why opposing vivisection is such a huge issue for so many. As the crowd left the square, a huge spontaneous cheer and round of applause broke out amongst both the activists and the watching public, showing that attitudes can change and the time is right for these issues to take centre stage once more. After a short but noisy walk through one of the busiest streets on Earth, the demonstrators then began to slowly file into the location for the rally, ironically held in front of the boarded up Ministry for Agriculture and Fisheries building. Food was available for a donation towards costs by the renowned Nottingham based Veggies Catering Campaign, who were more than happy to share the street with two superb new vegan catering collectives, Fair Foods and Green Garden Cafe. Caroline Lucas, Green Party leader and MEP, was the first speaker at the rally, hitting out at the Labour government for reneging on their pre-election promise to hold a full review of testing on animals in the UK, and pointed out the fallacy of vivisection as a scientific practice. Daniel, an anti-vivisection activist from Sweden, spoke of his experiences going undercover in three animal experimentation laboratories in Stockholm. John Carmody, founder of the Irish group Animal Rights Action Network (ARAN), spoke of ARAN’s recent successes in staging publicity stunts to attract the mainstream media, thereby bringing the cause to the attention of thousands of people who wouldn’t otherwise take any notice. Richard Deboo spoke of his political party Animals Count, and reminded us that Parliament belongs to us, and the power to bring about a change in policy also belongs to us. Debbie, an activist from Stop Huntingdon Animal Cruelty (SHAC), stressed the need to keep up the pressure on Huntingdon Life Sciences and their suppliers and clients, and reminded us that vivisection has resulted in the deaths of many humans as well as many non-human animals. Finally the compere of the rally said that the anti-vivisection movement had three fronts to campaign on; ethical, scientific and legal, and that the legal side was likely to throw up some unpleasant results for animal experimenters, and sooner than they expect. He gave some careers advice for people currently working in vivisection labs. Joking that there was a shortage of plumbers at the moment, he advised them to leave their current jobs and either become plumbers or retrain and start doing some real science.